The Commission of Diwani Order (87) of 2018 discussed mechanisms for implementing the housing reconstruction strategy and developing the housing sector in the liberated areas. 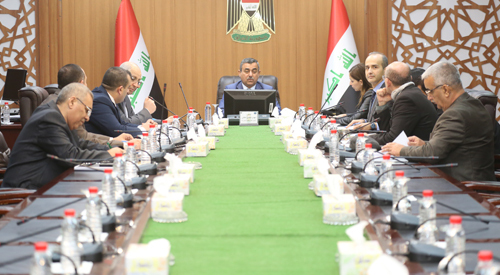 The Chairman of the Committee Secretary General of the Council of Ministers d. Mahdi Al-Alaq during the meeting held in the Secretariat building on the importance of determining the general directions for the implementation of recovery plans and the restoration of stability, pointing to the need to link compensation provided by the Iraqi government within the law of the Committee for compensation of those affected by terrorist operations and military errors, reconstruction and reconstruction of damaged housing units. The committee, which includes the Ministries of Reconstruction, Housing, Municipalities, Public Works, Finance and Planning, and the Reconstruction Fund for the Affected Areas, as well as the World Bank Mission in Iraq and the United Nations Human Settlements Program in Iraq (UN-Habitat) Reconstruction plans. The United Nations Program also provided a summary of the total work carried out by international organizations during the previous period on the provision of housing reconstruction and reconstruction requirements amounting to about (12) thousand housing units.